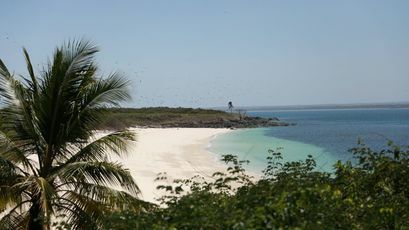 Isla Iguana a Panama paradise island off the coast of Pedasi that has been a sanctuary for US unexploded bombs since WW II, has finally got the All Clear. The 87-hectare wildlife refuge and popular tourist destination has been the target of an intense decontamination program by National Security explosives experts after the discovery of four unexploded 500-pound bombs in less than a month.The first two were found on El Cirial beach by Environment Ministry (Mi Ambiente) rangers, and the others by the explosives personnel conducting an island-wide sweep. On Thursday, March 1 the Ministry of Environment in Los Santos announced that starting from Saturday, March 3, tourists, and local fishermen who act as water ferries can return. Entrance to the area was closed on the last day of Carnival, February 13. Other islands in the region were used as US Military training grounds following a 10-year post-war agreement, signed in 1947 by the reigning Panama Foreign Affairs Minter and the US Ambassador to Panama. And will all the islands be thoroughly checked for more US gifts?? Amazing ! !